Twenty one delegates from golf clubs across the UK visited Ransomes Jacobsens’ European headquarters for the BIGGA Future Turf Managers’ Initiative (FTMI), sponsored by Jacobsen. This three-day educational event is aimed at up and coming greenkeepers who are focused on making the career leap to Head Greenkeeper or Course Manager. Focusing on personal and professional development, the FTMI programme utilises the expertise of respected course managers, cross-industry training specialists and industry experts to mentor and educate the next generation of industry leaders. Arriving at lunchtime on the first day, the group was welcomed by Gina Putnum, Ransomes Jacobsen’s Director of International Marketing and Communications, before being split into groups and touring the manufacturing facilities. This was followed by a light-hearted golf competition on the company’s three-hole golf course, the RJ National, which provided an opportunity for the delegates to interact with each other. 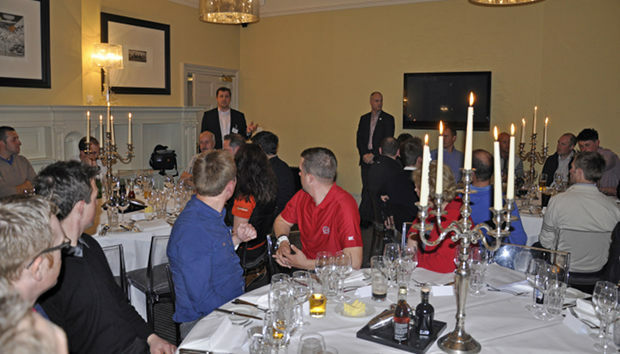 Day 1 finished with a dinner at a local hotel where Sales Director Rupert Price and BIGGA CEO Jim Croxton officially welcomed the delegates and introduced the mentors and other members of the Ransomes Jacobsen/BIGGA team. An intensive second day began with Lorna Sheldon, a respected personal communication and presentation skills trainer, providing valuable insights into writing a CV and the importance of the accompanying covering letter. This was followed by Dr Frank Rossi Ph.D, Director of Turfgrass Agronomy at Cornell University, New York who spoke about the research he had conducted on maximizing performance and minimizing stress on golf greens. After lunch, Lorna Sheldon returned for a seminar on preparing for an interview and the techniques required when in front of an interview panel. This was followed by role play with the delegates assisted by the five mentors – Steve Chappell, Matt Plested, Mike Sawicki, Lee Strutt and Stuart Yarwood. The day in the classroom concluded with one of the mentors Steve Chappell, Head Greenkeeper of the PGA Centenary Course at Gleneagles giving his opinion on the importance of volunteering and the career opportunities it provides. The delegates then boarded a coach, returned to their hotel for dinner, after which, mentor Mike Sawicki, Club Manager at Dulwich & Sydenham Hill Golf Club, led an open forum on challenges in the workplace. The final day began with an intensive and highly informative interactive presentation by gWest’s Course Manager Lee Strutt, which provided an introduction to the golf course maintenance budget, the use of Excel spreadsheets and how to sell the budget to stakeholders. An early lunch was required to accommodate the next speaker, David Bancroft-Turner, a specialist in leadership development and organisational politics. Complaining that he had the dreaded ‘graveyard’ slot immediately after lunch he then went on for over three hours to provide a highly amusing, interactive and fascinating look at politics in the workplace and the tools used to handle this difficult issue. Stuart Green, of BIGGA’s Learning & Development department gave the final presentation looking at the benefits of Continuing Professional Development and how progressing up the management hierarchy requires a change in working habits and state of mind. It was left to Gina Putnam to close the event where she thanked the delegates and the mentors for their time and contribution to what was agreed by all, a very successful and worthwhile three days of first-class education.